Fungal nail infections or ‘Onychomycosis’ affect a huge number of adults in the UK, with some estimates reporting it to be present in 6 – 8 of the adult population. 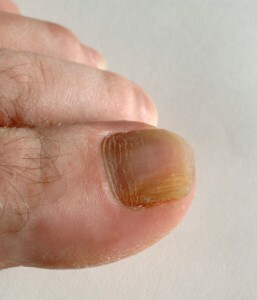 Given its widespread nature, there is relatively little public awareness of the disease and the treatment options, with many people visiting our clinic not even knowing that they have fungal toenails because it’s normally painless, and the symptoms may only be discoloration and thickening of the nail. There are a number of ways of getting fungal toenails with one of the most common being the spread of other fungal infections like athletes foot from your toes to your nails. Other include walking in damp places where fungi live like swimming pools. A damaged nail is often the way and starting point for any infection, and a poor general state of health can often increase the risk, as does a family history, increasing age and poor footwear choice. The fungi most commonly found to cause the infection are ‘Dermatophytes’ and ‘Candida’, but both are treated in the same way. Caught early enough and treated, fungal toenails can be cured and normal healthy nail left to grow in it’s place. The first thing to do if you think you may have a fungal nail infection is get a correct diagnosis. One of our team of Podiatrists will be able to do this for you. In addition to correct diagnosis and a treatment plan, one of the things we can do to dramatically help reduce treatment time is to reduce the thickness and amount of the infection by carefully and painlessly thinning out the infected nail with a scalpel.Â This is a skilled procedure and is not something you should ever try at home as you may injure yourself and actually spread the infection. We’ve been using lasers for medical and aesthetics treatments at our London clinic for nearly a decade. So when the evidence to prove that lasers were a fast, affordable, and pain free treatment for fungal nail infections and the success rate was very high we were fast adopters, and fungal nail lasers treatments were added to our list of services. Light based treatments offer such clear health benefits and as medical practitioners it’s really nice to have an effective alternative to slow topical and oral drug based treatments. The Laser we use for this treatment is called an ND YAG laser. There are very few Podiatrists trained in the use of these powerful Lasers and we’re lucky enough to have two practitioners on site at our London clinic. Our ND YAG operates at a very specific wavelength of 1064nm which clinical research shows during the months that follow post-treatment fungal spores are greatly reduced and in a majority of cases totally eradicated. However we also like to combine treatments to provide the maximum chance of success. Combinations include the removal of fungus using a scalpel, topical treatments, and the laser. Yes. So if you have infected toenails please avoid walking barefoot in places where other people may also walk and do not share towels or shoes until you have been treated. Yes. Not only can the fungal inflection move to other toe nails it can move to other parts of your body including between your thighs. If you decide to have diagnosis and / or treatment that does not involve the Laser and involves both the thinning of the nails and topical or oral treatments each visit will cost £43. The use of ND YAG lasers to treat fungal toenails on both feet may take up to four treatments Four treatments are recommended for the best chance of success which is £400 in total. If you suspect you have a fungal nail infection and would like a correct diagnosis and treatment, call 020 8653 5646 to arrange an appointment.